Are you dissatisfied with the look of your smile? If so, then ask your Denver dentist about dental veneers, which are a favorite among patients who want to drastically improve the appearance of their smile. Porcelain veneers are a cosmetic dentistry treatment that dentists often recommend to individuals who have gapped, crooked, stained, chipped, or worn down teeth. 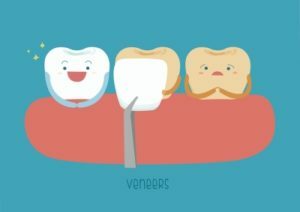 Dental veneers can be thought of as caps for the front of your teeth, and they are usually applied to the teeth, which show the most when a person smiles. After examining your teeth and gums to ensure that you’re a good candidate for this treatment, your dentist will prepare your teeth by removing a thin layer of enamel and then taking an impression. Using the impression of your teeth, veneers will be custom-designed for your mouth. Once they are ready, you’ll visit your dentist to have them permanently bonded to your teeth. Some individuals may benefit from minimal prep or no-prep veneers, so ask your dentist about these options as well.